There is 1 review for 'Blood of Calamity'. 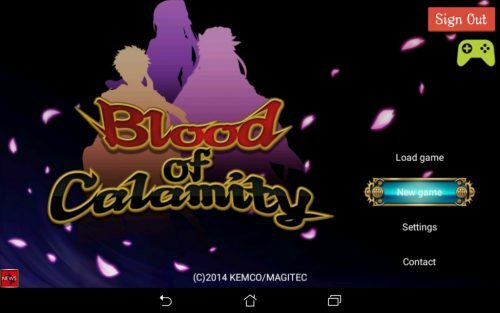 Blood of Calamity is a rare game which is set in a fictional Japanese-style setting instead of the usual European medieval fantasy. This is a good thing, and alternative settings should be encouraged. I personally enjoyed the battle and skill system, though the latter might do well with a guide, I kind of enjoyed the risktaking in putting points in certain stats without knowing. I finished the game without the guide and without much grinding. In terms of character use, I stuck with the starting two for the entire game and did fine, only switching the third member for one you get later. The world map itself is unfortunately bland and boring. The only settings you’ll be setting are towns, castles/mansions, shrines, mountains, forests and caves. Even when things get serious, you won’t be seeing any real variety in the scenery. There isn’t any in the one unlockable area, either. A lot of people complain about Kenshiro (the protagonist’s) behaviour, but I didn’t see it that way. I thought that it’s a good thing, to have a character who initially starts out irresponsible and dislikeable but learns to become a leader. My only complaint, if anything, is that he switches from one to the other a bit too easily, and around halfway through the game his womanizing tendencies just disappear. My biggest problem with the plot is something that happens later. Let’s just say the two protagonists of the setting do something for personal reasons that is spectacularly stupid, and there’s just not enough there to justify the supposed emotions making them take these actions, that makes going through it more frustrating as you feel like you’re solving the problems created by your own characters’ idiocy. Having gotten it on Android, it was worth the low price but it wouldn’t be worth much more. which store is this one listed under?